Forge the final links in your Maester's chain with attachments that will make your attached Maesters invaluable allies on your path to victory. Or boost your strategies with two new plots which allow certain characters to attach and defend without kneeling during intrigue challenges. Here to Serve introduces a wealth of new deck-building possibilities, especially for decks that feature Maesters. Prepare yourself for the conclusion of Secrets of Oldtown with Here to Serve! 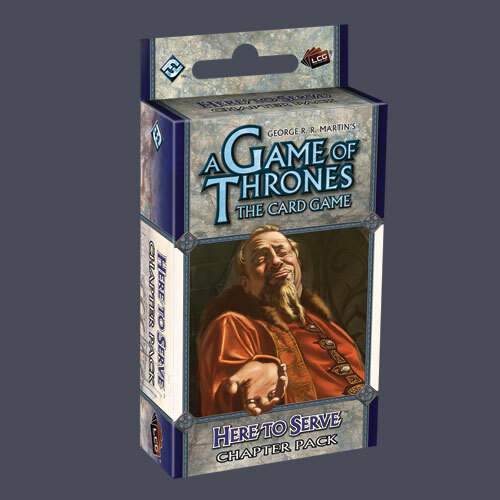 The A Game of Thrones LCG core set is required to play. Contains cards 101-120 of the Secrets of Oldtown cycle.